Can we all just take a minute and sing praises to the heavenly spirits that have created a world where Nigella Lawson exists? Nigella's latest book Simply Nigella was released on Thursday, but was ready and waiting for me on my doorstep after work on Wednesday. Cue worryingly excited squeals. I've had a very quick flick through each recipe and even without having tested a single one, they all look totally delicious and complete culinary winners. I'm excited to have an indulgent day and tuck into a bowl of the Sweet Potato Macaroni Cheese, amongst several others. Nigella excitement aside, I feel regretful that this weeks menu chez SSL has been somewhat uninspiring. 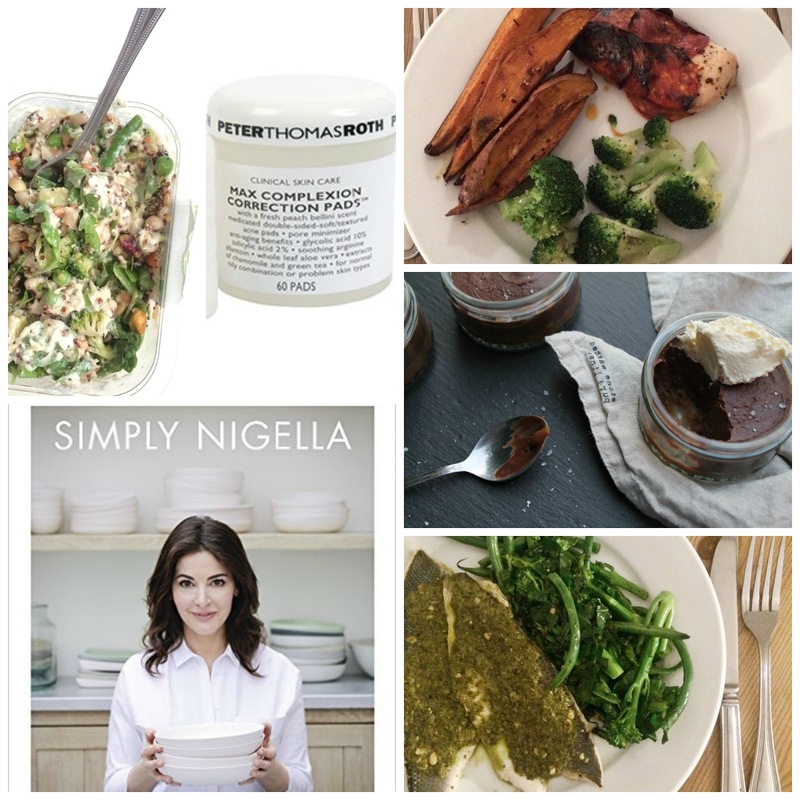 Simply Nigella has certainly come along at the right time to re-inspire my tastebuds! I've been enjoying sweet potato wedges with almost everything, such as steak and this chorizo chicken 'parcel'. Last night I was craving greens and fish, so opted for some sea bass smothered in fresh pesto and lots of buttery garlic greens. I also treated myself to the M&S Nutty Super Wholefood Salad which came with a tasty tahini dip. Earlier this week I posted about 7 Easy, Healthy Recipes For When You're Feeling Run Down. Often I find myself totally void of energy and just want something quick and easy, all the while nutritious on my plate ASAP. If you're ever in this sort of a situation, I suggest you check the post out. I received several beautiful beauty bits and pieces in the post, namely skincare which I often get more excited about than make up. The majority of my skincare has recently come to the end of its cycle, so it was the perfect time for an influx of new products to test and see if they'll work their magic on my face. So far, some great results. I'll share with you on Thursday my 'haul' and initial opinions. So the week started off on what I'd at least like to think was a very positive note. I'd share more but I hate to jinx things so - please keep your fingers crossed! Even though I've been busy and exhausted from long working days, I've been feeling somewhat slightly more relaxed and upbeat which can only be a good thing, right? It's been a little while since I updated you on my absolutely brilliant pop music picks, mainly because I've been stuck in a rut of the same old Carly Rae Jepsen/Marina & The Diamonds/a bit of everything playlists. I've been jamming away to Selena Gomez's (yes, really) latest release, Revival and my ears are happy. Me & The Rhythm is my standout - a total chilled, disco inspired banger. It makes me think of golden skin, 70s Hollywood, glamour and glitter. Give it a listen - you'll know what I mean! I have a guilty pleasure in the Pots & Co Salted Caramel Pots - you can find them in Waitrose and they're little pots of heaven. Lizzie, however, has shared this absolute masterpiece of a recipe with the world which I can imagine is like the Pots & Co version, just even more delicious. Cannot wait to give these a try. Everything about Hannah's 20 Things That Are Only Ever a Good Idea When You're Hideously Drunk is ridiculously spot on. Why it ever seems like a good idea to sit on the loo, contemplating your life and chuckling away to yourself having consumed almost an entire bottle of wine, I will NEVER know. And taking up your phone's entire memory with hideous selfies. Why. Pumpkin Butter - enough said. Lauren Conrad has encouraged me to start thinking about going for a semi-regular facial (because girl's got bills to pay) following her tips on How To Make Your Pores Appears Smaller. Lizzie's been on fire with her posts this week - she also shared her tips on saving money at the supermarket. Planning the next week's food shop as we speak... #SAVINGS! I can always turn to Mel for some well thought out and motivational tips on turning your blog into feasible business. This week she's talking about learning from your failures - something I'm definitely paying attention to! One of my all time favourites, Laura, shared a day in the life which I thoroughly enjoyed! I don't care who you are, or whether you think you've got your life sorted - you MUST read Kate's (LaVie - RIP Gh0stParties, sob) 5 Things: Becoming More Independent. I pride myself in being an independent young lady, but there were certainly things I took away from her post that gave me a kick up the bum and has made me reconsider a few things.